Families are going to need some help from time to time. It can be hard for some people to ask for help. It is important to recognize that asking for help is not a sign of weakness but actually a sign of strength. Being resilient means being able to recognize a problem, deal with it, and bounce back quickly, sometimes that means asking for help. The more resilient we are we’re better able to deal with bigger problems. Our social networks are a good place to look for help. Family, friends, neighbors and coworkers all have skills and resources that can be useful. Some examples might be asking your parents to babysit or asking a coworker who lives near you for a ride to work if your car breaks down. Asking for help to deal with smaller problems can keep them from becoming bigger problems. If it is a bigger problem we may need to look outside our social network and at resources in our community. Schools, churches, afterschool programs, and nonprofits are all excellent resources in a community. Many of them also have connections to other resources that they can direct us to if they aren’t able to help us directly. 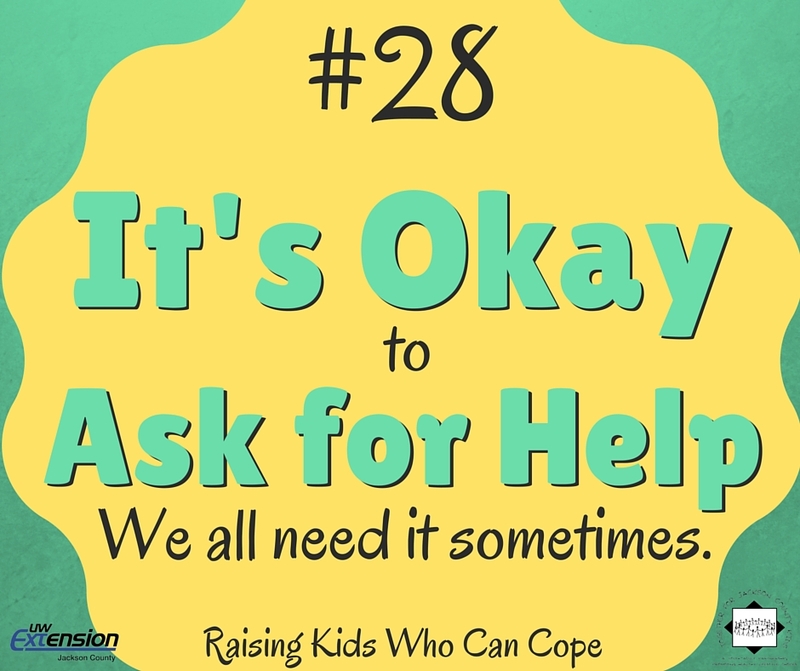 This entry was posted in Raising Kids Who Can Cope and tagged coping skills, help, managing stress, support, youth. Bookmark the permalink.